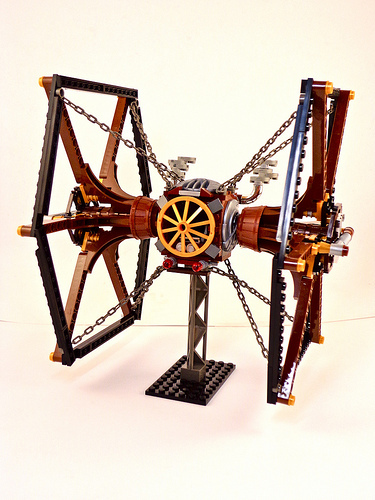 Sean Jensen follows his terrific Steampunk X-Wing fighter with a brilliant take on that ubiquitous Imperial workhorse, the TIE Fighter. Giving Star Wars vehicles and characters a Steampunk makeover is nothing new, but Sean has nailed the precarious, ramshackle, and gilded style quite well. The chains governing the wings are quite a nice touch.